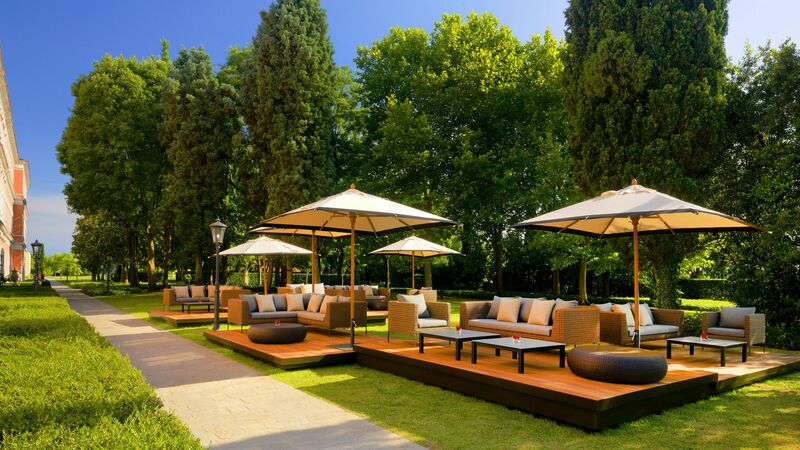 With its grand sweeping hallways, exquisite decor and perfectly manicured gardens, prepare to feel like royalty from the moment you step onto the grounds of the San Clemente Palace Kempinski Venice. Once a monastery belonging to the Order of the Camaldorese monks, this stunning 17th Century property has been meticulously renovated to give you the epitome of luxury, modern travel. It’s not just the amazing architecture that makes this hotel so incredibly special. It’s the location. This private island is just minutes from central Venice. And as sophistication is what this hotel does so perfectly, your transport to and from the heart of the city will be via your own exclusive boat. High ceilings, tasteful furniture and art lined walls are what to expect from the spacious rooms. A perfect balance of comfort and beauty. And a magical retreat for a couple or family seeking a high end weekend getaway. Despite being so close to the hustle and bustle of this historical city, you’ll be blown away by the peace and tranquility of your five star surroundings. Here you can enjoy a turquoise swimming pool, a top of the range fitness centre, a choice of exceptional restaurants and views that will take your breath away. Located within the main hotel, Acquerello offers exquisite culinary delights that take diners on a complete sensory experience. Masterminded by Executive Chef Roberto Dal Seno, each modern Mediterranean dish is an ode to the spectacular surroundings in which the restaurant is located, and is made with the freshest locally sourced ingredients. Open from 18:30 - 22:30. If you’re a fan of superior champagne and exotic cocktails, this is the perfect spot for you. The bartenders here are not just the best in the business, they’re extremely passionate about their art, so expect delicious drinks with a slice of history about their origins. Open from 10:00 - 01:00. Enjoy al fresco drinks that are just as magnificent as the views the bar offers of Venice City. Open from 10:30 - 00:00. 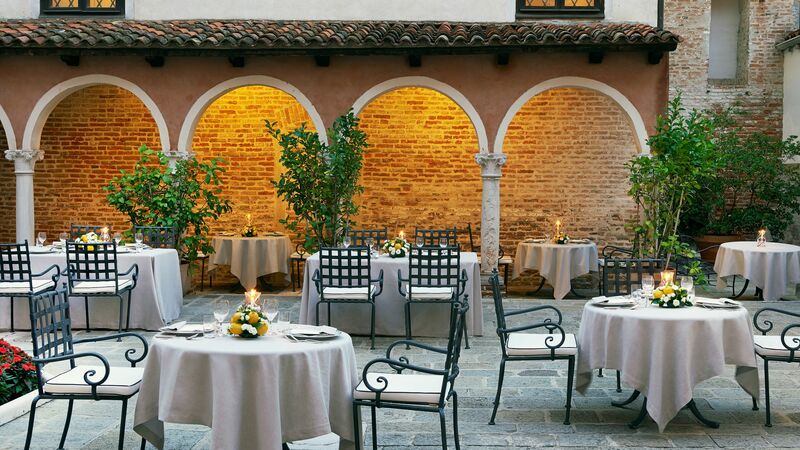 You’ll feel right at home at this informal and very welcoming restaurant, set in the beautiful historical courtyard of the hotel. This is also where breakfast is served daily. 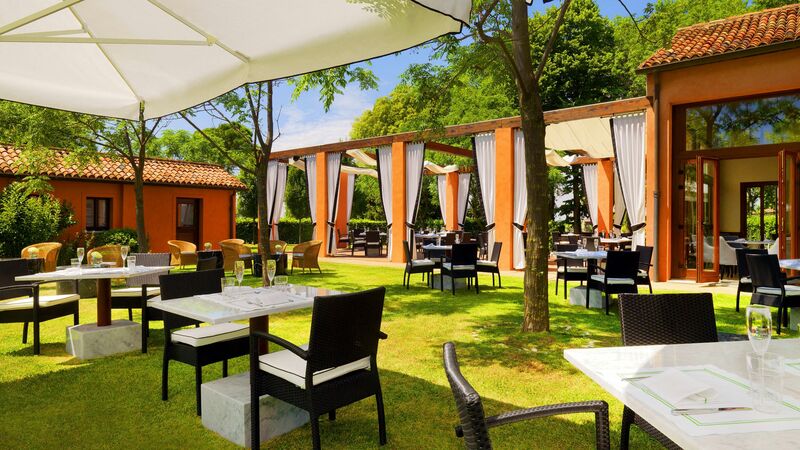 Indulge in an afternoon tipple or grab a light bite in this shaded haven located in the tree filled gardens. Open from 11:30 - 17:30. 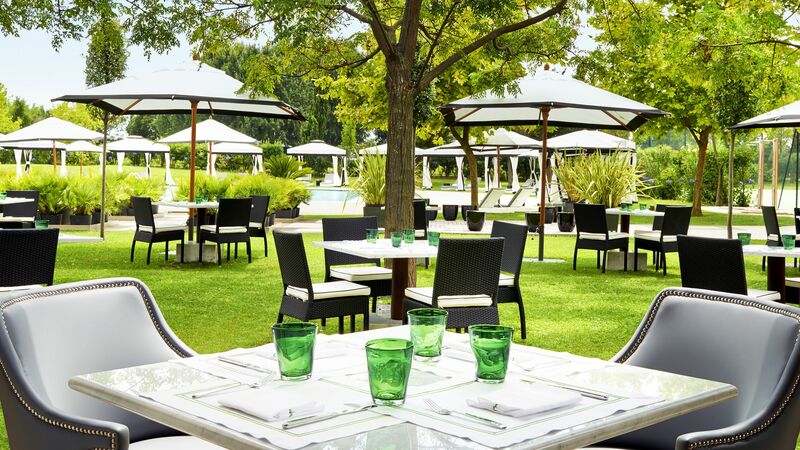 Nestled into the stunning gardens of the property, this informal outdoor eatery offers simple but extremely tasty food made with seasonal, local produce. From fresh pizzas baked in the wood-fired oven, to sizzling seafood straight off the barbecue, there are dishes to suit every taste. Open from 11:30 - 22:00. 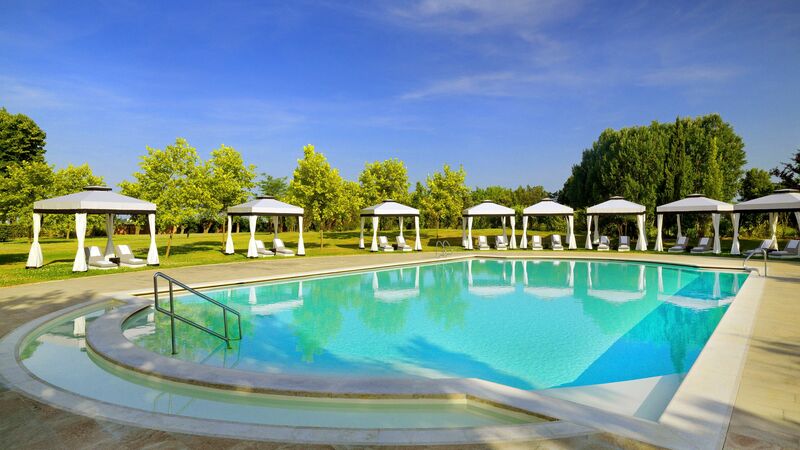 Relax by the outdoor heated swimming pool set in perfectly landscaped gardens filled with ancient Cyprus trees and beautiful flowers. Open from 09:00 - 18:00 May - September. 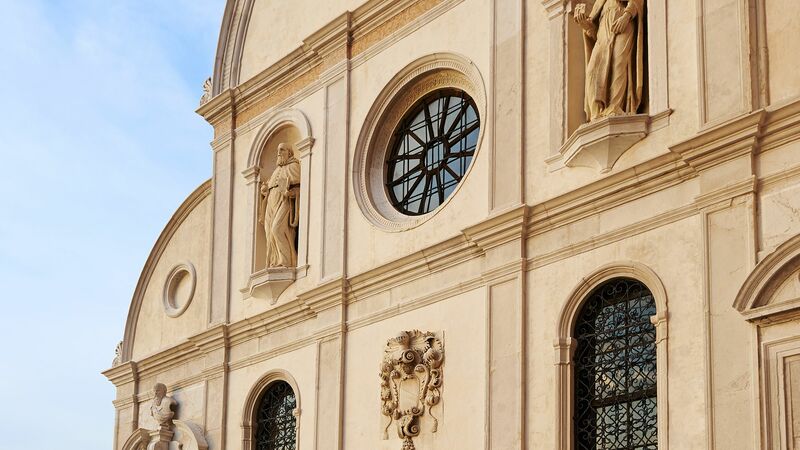 Family Traditions at San Clemente Palace covers a broad spectrum of inclusive services that combine to create an all-round family-friendly package. There are fun active experiences like tennis and swimming, hand-picked local attractions and recommendations offered by the hotel team, and a payable kids' club for guests aged three to 11. In need of some indulgence and relaxation? Look no further than the Merchant of Venice Spa. This heavenly scented sanctuary offers an extensive array of treatments that will pamper and preen you, leaving you feeling refreshed and rejuvenated. For those in the mood for exercising, the gym is open all day, every day. Fitted with quality Technogym machinery and weights, you can get your heart racing in no time. In the hotel grounds, guests can enjoy an asphalt tennis court, with lessons available for a local charge. There's also a jogging track around the grounds. Guests can explore the stunning twelfth century Church of San Clemente, which is available for events such as weddings and concerts. The complimentary boat shuttle departs every thirty minutes, and drops guests off at the historic St. Mark's Square. Here you can explore Venice's unique architecture and art. The nearby Pitch & Putt course is perfect for a quick round to hone your skills. The course contains a picturesque lagoon, and is free for guests to use. Equipment is available for rental. Venice is known as one of the most romantic cities in the world. From its historic cobbled streets where you can duck into traditional restaurants and upmarket boutiques, to winding waterways and canals, there is so much to be explored. Head to St. Mark’s Square in the centre for beautiful views of the church and a chance to feed the local pigeons. Or simply allow yourself to be punted through the canals in a gondola, taking in the romance and beautiful architecture. 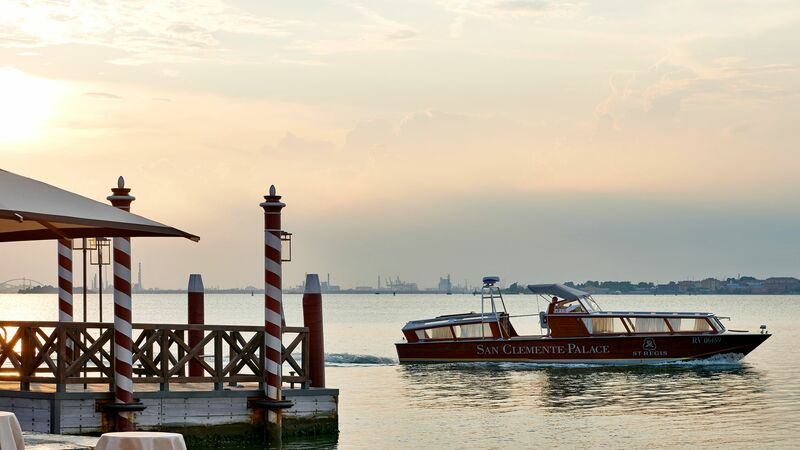 San Clemente Palace Kempinski Venice is located on its own private island, surrounded by glittering waters and just minutes away from the main attractions of the city. It’s ideal for those wanting to enjoy a serene location, close to the action. 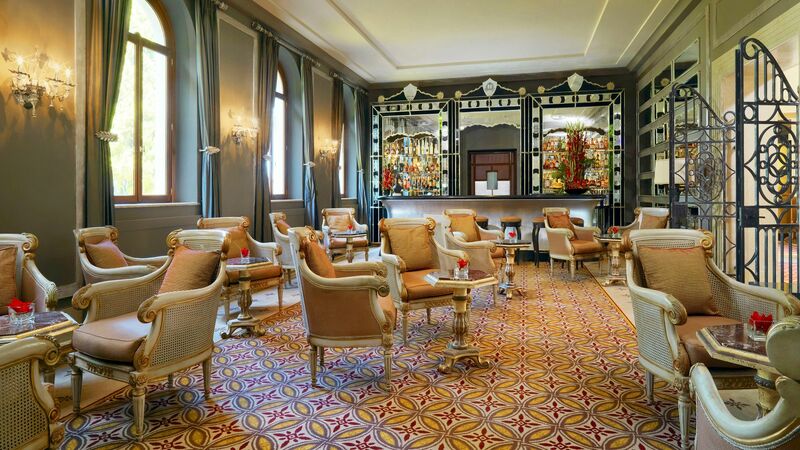 San Clemente Palace Kempinski Venice is an hour and 30 minutes from Marco Polo Airport. Deluxe Rooms are 35m² and combine comfort with style. They are decorated with fabric-covered and painted walls and have romantic views over the island's centuries-old park or the palace's internal gardens. Grand Deluxe Rooms measure 40m² and are decorated with heritage terrazzo floors, contemporary rugs, paint and silk fabric covered walls. They feature a comfortable sitting area with writing desk, a king-size bed or twin beds, high Venetian ceilings and windows that face on to the hotel's internal courtyards or manicured park grounds. Grand Deluxe Rooms with Lagoon View effortlessly combine comfort with contemporary and heritage decorative elements including terrazzo floors and contemporary rugs. They measure 35m² and boast large windows with panoramic views of the waters and islands in the lagoon surrounding San Clemente island. Junior Suites measure 52 - 64m² and are decorated in a style that combines Venetian design with modern elegance. The large windows allow for plenty of natural light, offering views over the gardens. The suites feature a sitting area and desk space. Superior Rooms measure 26m² and are elegantly decorated with Murano glass light fittings and precious fabrics and brocades that reflect the artisan legacy of Venice. They overlook the internal courtyards and feature a king-size bed or twin beds, marble bathroom with bathtub, bathrobes and slippers, air conditioning, 42" TV, complimentary Wi-Fi and safe. Venice Suites are spacious at 70m² and have contemporary decorations that blend with legacy design elements such as high Venetian ceilings. They feature a king-size bed or twin beds, a walk-in wardrobe, large entrance and a separate living room overlooking the palace's heavenly gardens. I absolutely enjoyed my stay at the unique property in Venice! 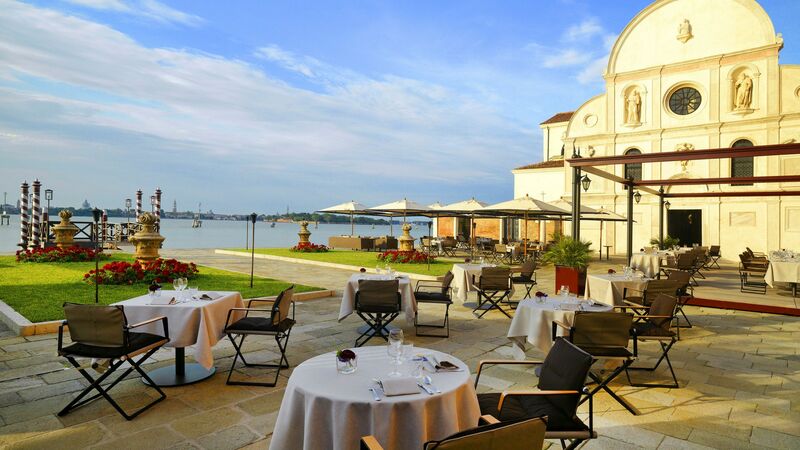 The hotel is located on a private island just 15 minutes away from San Marco. Just alone the arrival experience is incredible, hoping on a boat after busy Venice (especially now during Easter it was really crowded) and arriving on the calm island was great! They really have these wooden, typical Venetian boats! Breakfast buffet was really great although the hotel must have been full during these days. The hotel has a unique Venetian design. My room had a probably 3 to 5 meter high ceiling. We had dinner at La Dolce by the pool which was really casual and you can enjoy a great pizza! I recommend the truffle pizza! Positive: - The location - Even though the hotel is not on one of the main areas of Venice, they provide free shuttle service every 30 mins to San Marco. This shuttle service lets you see the San Marco and other attraction areas from the sea and lets you escape from the crowdedness of Venice. The hotel owns the island so it is very private - The spacious, modern and clean rooms with a huge bed. - The hotel's pool that was heated. - Breakfast was buffet style with good amount of choices. Negative: - Can't really think of anything. As a couple we truly enjoyed the hotel and staff was very professional and helpful.